This paper was presented at the Commission 7 Annual Meeting in Bergen, Norway, 24-28 September 2018. The paper initially provides background to the 2030 Global Agenda and the realisation that many of these goals will not be achieved without quickly solving the current insecurity of tenure crisis through the FFP approach to land administration. Finally, the paper reviews the lessons learned from implementing FFP land administration solutions in three developing countries, Indonesia, Nepal and Uganda. There are two major drivers that are increasingly encouraging and compelling countries, especially developing countries, to adopt a Fit-For-Purpose (FFP) approach to land administration. The first relates to the Global Agenda as set by the Sustainable Development Goals (SDGs) and other frameworks, such as the New Urban Agenda, where it is now accepted that security of tenure is a prerequisite for successful transformational change. The second is about taking advantage of the opportunities provided by new and emerging game-changing technology developments that change the focus from costly, high-tech solutions to providing fast, low cost, participatory approaches for achieving secure tenure for all. This paper initially provides background to the 2030 Global Agenda and the realisation that many of these goals will not be achieved without quickly solving the current insecurity of tenure crisis through the FFP approach to land administration. New technology and emerging trends for land administration, identified within the World Bank’s Guide (2017), will then be reviewed within the context of implementing FFP land administration solutions. Finally, the paper will review the lessons learned from implementing FFP land administration solutions in three developing countries, Indonesia, Nepal and Uganda, to identify how their country strategies were evolved, how the FFP land administration guidelines were interpreted and adapted, how politicians and decision makers signed onto the approach, and how the mind-set of key stakeholders, including surveyors, were changed to embrace FFP land administration. Most developing countries are struggling to find remedies for their many land problems that are often causing land conflicts, reducing investments and economic development, continuing poverty, hunger and malnutrition, and preventing countries reaching their true potential. Existing investments in land administration have been built on legacy approaches, have been fragmented, and have not delivered the required pervasive changes and improvements at scale. While a wealth of literature emphasizes the need for security of tenure and elaborates on its benefits, including the opportunities of significantly contributing to poverty reduction and sustainable development, the conventional approaches to land administration do not make this a reality. The standard solutions have not helped the most needy - the poor and disadvantaged - that have no security of tenure. In fact, the beneficiaries have often been the elite and organizations involved in land grabbing. It is time to rethink these traditional approaches. New solutions are required that can deliver security of tenure for all, are affordable and can be quickly developed and incrementally improved over time. The FFP approach to land administration has fortunately emerged to meet these simple, but challenging requirements. There is a broad agreement that, while the Millennium Development Goals (MDGs) provided a focal point for governments, they were too narrowly focused. The MDGs are now replaced by the Sustainable Development Goals (SDGs) with a new, universal set of 17 goals and 169 targets that UN member states are committed to use to frame their agenda and policies over the next 15 years (2016-2030), see Figure 1. The goals are action oriented, global in nature and universally applicable. Targets are defined as aspirational global targets, with each government setting its own national targets guided by the global level of ambition, but taking into account national circumstances. The goals and targets integrate economic, social and environmental aspects and recognise their interlinkages in achieving sustainable development in all its dimensions. Figure 1. The Sustainable Development Goals (UN, 2015). The SDGs provide a framework around which governments, especially in developing countries, can develop policies and encourage overseas aid programmes designed to alleviate poverty and improve the lives of the poor. In particular, the SDGs Target 1.4 (secure tenure rights to land) will not be achieved with conventional land governance. Similarly, the land component is referred to in target 3 of Goal 2 on ending hunger, and, more generally in Goal 5 on gender equity, Goal 11 on sustainable cities, Goal 15 on life on land, and Goal 16 on peace, justice and strong institutions. These goals and targets will never be achieved without having good land governance and well-functioning countrywide land administration systems in place. The SDGs represent a rallying point for NGOs to hold governments to account. In other words, the SDGs are a key driver for countries throughout the world – and especially developing countries – to develop adequate and accountable land policies and regulatory frameworks for meeting the goals. It should be recognised that, next to the SDGs, the wider global agenda includes a range of global issues, such as responsible governance of tenure, human rights and equity, climate change and natural disasters, rapid urbanisation, and the New Urban Agenda – see Figure 2. Figure 2. The wider global agenda includes a range of land related issues. Solutions to the overall global land issues relate to alleviation of poverty, social inclusion and stability, investments and economic development, and environmental protection and natural resource management. These land matters are now embedded in the SDGs and the land professionals are the custodians of the systems dealing with these land issues and responsible for delivering appropriate land administration policies and services. There is a strong requisite for effective monitoring and assessment of progress in achieving the SDGs as provided through the annual progress reports (UN 2017). There is a need for reliable and robust data for devising appropriate policies and interventions for the achievement of the SDGs and for holding governments and the international community accountable. Such a monitoring framework is crucial for encouraging progress and enabling achievements at national, regional and global level. This calls for a “data revolution” for sustainable development to empower people with information on the progress towards meeting the SDG targets (UN, 2014, p.7). The FFP approach is flexible, includes the adaptability to meet the needs of society today and the outcome can be incrementally improved over time, when required. The FFP approach takes advantage of advances in technology development that now allows for aerial / satellite imagery to be provided quickly and at low / affordable costs. These imageries can be used for identifying and recording the visible boundaries of the individual land parcels rather than using conventional field surveys and complying with high accuracy standards. The identification and recording of visual boundaries is undertaken in a participatory process involving the local community. The participatory process may also include “walking the boundaries” using handheld GPS to capture boundary corners on a tablet imagery. This simple identification and recording can be upgraded over time, e.g. triggered in response to social and legal needs of economic development, investments and financial opportunities that may emerge over the longer term. The FFP approach thereby enables land rights to be secured for all in a timely and affordable way. Similarly, the FFP approach looks at recording all rights – legal as well as legitimate – and enables for updating and upgrading over time in accordance with the continuum of land rights (UN-HABITAT/GLTN, 2008). The FFP approach also advocates for the use of a flexible ITC approach and an integrated institutional framework without bureaucratic barriers. Implementers: Public and private sector land professionals involved in land administration; NGOs / CSOs. 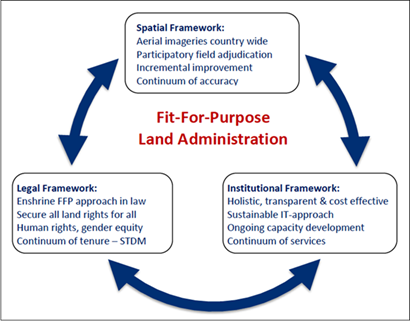 The FFP Land Administration approach (Enemark, et al., 2016) provides an innovative and pragmatic solution to land administration. The solution is focused on developing countries, where current land administration solutions are not delivering, with often up to 90 per cent of the land and population in developing countries left outside the prevailing formal version. The approach is directly aligned with country specific needs, affordable, flexible to accommodate different types of land tenure, and also upgradable when economic opportunities or social requirements arise. It is highly participatory, can be implemented quickly and aimed at providing security of tenure for all. Most importantly, the FFP approach can start very quickly using a low risk entry point that requires minimal preparatory work. It can be applied to all traditions of land tenure across the globe. 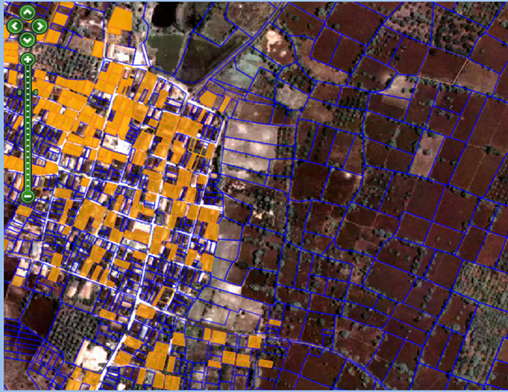 To significantly accelerate the process of recording land rights, the FFP Land Administration approach advocates the use of a range of scales of imagery as the spatial framework, wherever feasible, on which to identify and record visible tenure boundaries. This fast, affordable and highly participatory approach is appropriate for the majority of land rights boundaries. Using imagery also allows the spatial framework to be used by many other land administration and management activities and generate wider benefits. Security of tenure does not in itself require precise surveys of the boundaries. The most important aspect of security of tenure for the majority of unregistered land parcels is identification of the land object and its relation to neighbouring objects, in relation to the connected legal or social right. The absolute precision of the survey is less important, except perhaps in high value land and properties, and non-visible or contested boundaries when higher precision, but more costly conventional ground survey methods and monumentation, may be necessary. Which imagery (satellite, aerial or drone) and what resolution are appropriate? Should we continue with paper orthophotomaps to support mapping and adjudication participation? Or should we adopt mobile technologies? How does urban density influence our choice of survey technique? Do community mapping and rights adjudication tools have a role to play within formal land administration systems, and can they support mainstream activities? Is automatic extraction of linear and settlement features suitable for land administration? Are modern SMS or other mass media approaches appropriate to raise public awareness of land registration programs? What are the key technological gaps and emerging trends? The purpose of the Guide is to provide designers of country-specific FFP Land Administration strategies with guidance on the current status of technology and emerging trends. This should allow the most appropriate technical solutions to be adopted in designing and implementing the Spatial Framework for the FFP Land Administration approach. This guidance aims to ensure that the capture, management and dissemination of land rights information will be achieved using the most cost-effective solutions, meets the precision and accuracy requirements, matches the technical resources within the country, is compatible with social cultures and can be implemented quickly over large areas. Therefore, the Guide should be used in conjunction with the GLTN sponsored “Fit For Purpose Land Administration: Guiding Principles for Country Implementation.” (Enemark, et al., 2016). The FFP concept includes three core components: the spatial, the legal, and the institutional frameworks – see Figure 3. Each of these components includes the relevant flexibility to meet the actual needs of today, yet can be improved incrementally over time in response to societal needs and available financial resources. The three framework components are inter-related and form a conceptual nexus underpinned by the necessary means of capacity development. Each of the frameworks must be sufficiently flexible to accommodate and serve the current needs of the country within different geographical, judicial, and administrative contexts. Hence, although the Guide covers technology solutions, it is imperative that the decision making process on technology is made with the full understanding of the impact on the legal and institutional frameworks. Importantly, prior to building the spatial framework and issuing any certificates of land rights, it must be ensured that the regulations and institutions for maintaining and updating the FFP land administration system are in place. Without the institutional capacity and also incentives for the parties to update the system in relation to the transfer of land rights and land transfers, it will quickly be outdated and unreliable and lead to waste of investments for building the system in the first place. Figure 3: The Fit-For-Purpose Concept and associated Frameworks (Enemark, et.al. 2016). Use of cloud and/or blockchain technology for immutable recording and management of rights. Use of modern data model standards (LADM and STDM) for defining, recording and managing rights, restrictions and responsibilities, especially ensuring no gender or other bias. Role of Technology – Information Capture. Capturing Land Rights in the Field. Role of Technology – Managing, Maintaining and Disseminating the Information. This section identifies additional considerations largely beyond the scope of technologies and approaches reviewed, including institutional and legal frameworks, capacity development and sustainability. Appendix A: Detailed descriptions of the new and emerging technology solutions. Appendix B: Detailed discussion on key considerations to support choice and implementation of the technology solutions. A short description on the land administration component processes covered by the selected section. A decision support diagram guiding the user through the key decisions. The main body of text then directly addresses key considerations and decisions to be made, referring to the corresponding existing and emerging technology/approach descriptions in Appendix A and additional ‘key considerations’ sections in Appendix B. Short case study examples provide experiences with applying the technologies. The World Bank expects that the Guide will be instrumental in paving the way forward towards implementing sustainable and affordable land administration systems in developing countries, enabling security of tenure for all and effective management of land use and natural resources. This, in turn, will facilitate economic growth, social equity, and environmental sustainability. A well know example of implementing the FFP approach at country level is the project in Rwanda of demarcating and recording 10 million land parcels over five years for a cost of 6 USD parcel. This project was completed even before the FFP principles were launched by FIG and the World Bank (FIG/WB 2014). Currently the FFP approach is being implemented in countries such as Ethiopia and Mozambique. It should also be mentioned, that many eastern European countries used such flexible and low cost approaches in the 1990s when undergoing a transition from centrally planned to market based economies. However, the most recent experiences from Indonesia, Nepal and Uganda are presented below. Indonesia is the world´s fourth most populated country with a land area close to 2 million km2 and a population of around 260 million people. It is estimated that Indonesia has about 120 million land parcels of which about one third are registered and only about half of these are spatially identified. About 3 million new parcels appear each year. Land administration in Indonesia is divided between forestlands, administered by the Ministry of Environment and Forestry (MoEF), and non-forest lands, administered by the Ministry for Agrarian and Spatial Planning (BPN). This results in duplication of policy, legal and institutional frameworks, and precipitates unclear tenure arrangements and legal recognition. The dualism also contributes to the slow recognition of customary (“adat”) communities’ rights on land and hinders the government’s ability to optimize land use and protect resources (World Bank, 2016). The lack of a unified spatial framework has created multiple conflicts between communities and other land users (ibid). In response, the Government of Indonesia introduced the One Map Policy (OMP) as an effort to establish a unified, agreed-upon, reference set of geospatial data that inform decision-making at the national and sub-national levels. The current OMP methodology aims to produce 1:50,000 scale maps based on over 80 thematic datasets and with limited or no ground verification. However, in order to identify reliably the land use and occupancy at the district and village levels, the OMP also supports village boundaries mapping by district governments at a scale of 1:10,000 or larger upon need. Furthermore, the President has set a target for registering 5 million land parcels in 2017, 7 million in 2018 and 9 million in 2019. This target can only be achieved using a FFP approach, even though some resistance is voiced, especially from the National Land Agency (BPN). Some preliminary piloting has already taken place, e.g. in Gresik District, East Java, see Figure 4. Figure 4. Example of demarcation of land parcels using high resolution imagery. Table 2. FFP transition process in Indonesia. The introduction of FFP land administration in Indonesia has primarily been led and imposed on the institutions by the President and driven by the priority land policy to introduce security of tenure to support economic development. However, success will depend on implementing institutional reform. The (then) Ministry of Land Reform and Management has been working for a few years on developing a draft National Land Policy. This policy aims to address the various land administration and land reform issues that have remained unresolved and under discussion for quite a long time in Nepal. In Nepal, almost 28% of the total land area is arable and only around 75 % of this is formally registered. The land administration system does not deal with non-statutory or informal land tenure. It is estimated that around 25% of the total arable land and settlements are outside the formal cadastre. This accounts for approximately 10 million parcels on the ground, including occupied land parcels that legally belong to either government, public or person/institution. This means that a significant amount of the Nepalese population is living in informality, without any spatial recognition and without security of tenure. The recent events, such as the mega earthquake of 2015 and post disaster reconstruction and rehabilitation, the promulgation of a new Constitution, and post conflict peace and social rebuilding have ignited the need for developing a strategy for implementation of the National Land Policy in the changed context, see: https://gltn.net/country-work/#nepal. 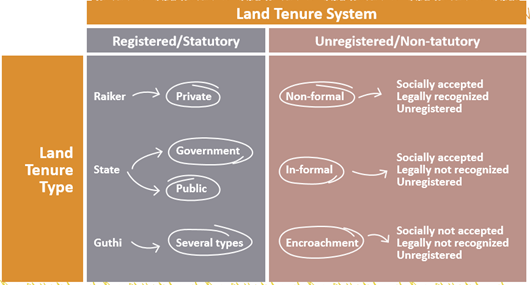 The current Nepalese land administration system (LAS) only deals with the formal or statutory land tenure system, while there are three types of non-statutory land tenure in the society: non-formal, in-formal and encroachments, see Figure 5. It is recognized that because of unsecured tenure, the settlers hesitate to invest on the land to improve its productivity, and without investment, production cannot be increased. All these consequences show that the land under informal tenure is causing huge loss to the economy and the valuable land asset is dumped as “dead capital”, see Figure 6. Figure 6. “Land administration is about people”. 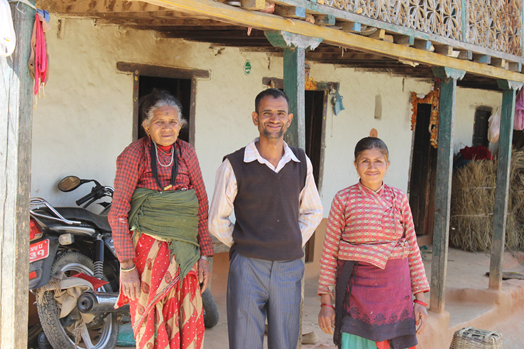 This family in rural areas, about 20 km outside Kathmandu, has occupied a small farm for four generations without any security of tenure to enable investments and improvement of their livelihood (Photo: Enemark, 2018). Therefore, it was decided, in cooperation with UN-Habitat/GLTN and Nepal civil society organisations, to develop an appropriate strategy for implementing the latest provisions made in the draft National Land Policy and the Constitution of Nepal. This should ensure social justice on the one hand, and on the other hand, lead to increased land productivity to support economic growth. The strategy document integrates the resulting FFP approach to land administration as a key solution to these problems. The strategy is strongly supported by government, including Ministry of Agriculture, Land Management and the Survey Department. Also, civil society organisations such as Community Self Reliance Centre (CSRC) and the National Land Rights Forum (NLRF) are very supportive, while some reluctance is voiced by the professional land surveyors. The draft strategy is currently (July 2018) under consideration and adoption at the Parliament in Nepal, including a timescale for implementation. The draft strategy document and an executive summary is available at: https://gltn.net/home/download/full-report-fit-for-purpose-land-administration-a-country-level-implementation-strategy-for-nepal/. A summary report can be found at: https://gltn.net/download/summary-report-fit-for-purpose-land-administration-a-country-level-implementation-strategy-for-nepal/. In Uganda, as in many Sub-Sahara African countries, colonial governments introduced land administration systems to deal with tenure insecurity. However, the tenure systems and procedures for legal recognition of tenure rights were not oriented to the context and realities of the African communities. The result is that even after independence, many countries have only managed to register less than 20% of their land. The Constitution of the Republic of Uganda of 1995 (Chapter 15) vests land in the citizens of Uganda hence giving powers to citizens to own land privately as individuals, families or communities. The 1995 constitution maintained the Freehold and Leasehold tenure systems that were recognised under the colonial laws. Furthermore, the 1995 constitution re-introduced the Mailo Tenure system that is comparable to freehold, the difference being the recognition of rights of occupants categorised under the Land Act as bona fide or lawful. The constitution also recognised customary tenure for the first time making it possible for holders of customary rights in land to acquire legal documents. Customary tenure accounts for approximately 80% of land in Uganda see Figure 7. Figure 7. Left: Uganda, with a population of 28.3 million and an area of 200.000 sq.km (excl. Lake Victoria waters), received independence 1961 after 70 years of British colonization. Middle: Land tenure in Uganda is divided between Native freehold 22% (grey), Mailo 28% (yellow) and Customary 50% (green). Right: Cadastral Information Branch Centres providing local access to reliable land information. Source. Government of Uganda. Even though the Uganda Land Laws allow for registration of Mailo (bona fide) titles and customary ownership (Certificate of Customary Occupancy) these opportunities are not enforced in practice. However, a number of recent pilot projects, carried out by donors and civil society organisations, have introduced the FFP concept as a vehicle for efficient and effective systematic registration of land rights for the remaining about 20 million parcels currently outside the formal system. As the challenges are enormous and the capacity of land stakeholders limited, the Global Land Tool Network engages in Uganda to scale up pro-poor land interventions in order to contribute to the achievement of tenure security for all, see: https://gltn.net/home/country-work/#uganda. Figure 8. Left: Community people discussing the outcome of a pilot project for registering land rights in the Mailo district of Central Uganda. Right: A satellite imagery showing the mapped parcel boundaries as demarcated though a participatory process (Photo: Enemark, 2018). The experiences of the pilot project are very promising and well-received by government as well as at the community level. Teams have been created, consisting a volunteer acting as locally trained land officer and two representatives from local government, to complete the parcel demarcation based on visual boundaries as shown on large-scale satellite imagery or captured in the field with hand held GPS. The Government of Uganda has now engaged with UN-Habitat/GLTN to develop a National Strategy for implementing a FFP approach to land administration. The aim is to register 20 million parcels within the next 10 years for a cost of around 10 USD per parcel. This base cost does not include further costs relate to institutional development, awareness raising and capacity development. The draft strategy presents the FFP concept and an assessment of the current land administration system in terms of shortcomings and constraints of delivering secure tenure for all. The requirements for building the spatial, legal and institutional framework is then presented along with the crosscutting issues, such as capacity development and budgetary costs over a period of 10 years. The draft strategy was recently (August 2018) presented and discussed at a workshop with attendance of all the key stakeholders and the final version is expected by the end of September 2018 for further discussion and approval at Parliament level. The strategy is well supported at the Prime Minister level, parts of the ministry of Lands, Housing and Urban Development, and various civil society organisations. Some other stakeholder, such as private licensed surveyors still voice some reservations even though there is a growing understanding of relevance of replacing costly field surveys with simple positioning at a lower accuracy, supported by boundary corner plants. This also relates to understanding the benefits deriving from a new role as land professionals being the custodians of a countrywide land administration system. Overall, the case of Uganda is very interesting for testing the implementation of the FFP approach at a national scale. There is a consensus that governing the people to land relationship is at the heart of the 2030 global agenda. There is an urgent need to build simple and basic systems using a flexible and affordable approach to identify the way land is occupied and used, whether these land rights are legal or locally legitimate. The systems need to be simple and flexible in terms of spatial identification, legal regulations and institutional arrangements to meet the actual needs in society today and they can then be incrementally improved over time. Building such spatial, legal, and institutional frameworks will establish the link and trust between people and land. This is possible due to emerging, game changing technology developments that enable mapping and registration procedures to be undertaking at much simpler, cost efficient and participatory ways. In turn, this will enable the management and monitoring of improvements in meeting aims and objectives of adopted land policies as well as meeting the global agenda. The results of the current country implementations of FFP land administration happening worldwide will make this approach compelling and widely adopted. At last there will be a scalable land administration solution implemented across the globe to eliminate the scourge of insecurity of tenure. All land professionals need to embrace and fully support this approach. Enemark, S., McLaren, R. and Lemmen, C. (2016): (2016): Fit-For-Purpose Land Administration – Guiding Principles for Country Implementation. UN-Habitat / GLTN, Nairobi, 120 p.
FIG/WB (2014): Fit-for-Purpose Land Administration. FIG Publication No. 60. UN (2014): The Millennium Development Goals Report 2014. UN-HABITAT/GLTN (2008): Secure Land Rights for All. World Bank (2016): Terms of Reference for Technical Assistance and Capacity Development for the Program Preparation to Operationalize and Accelerate the One Map Policy. Stig Enemark is Honorary President of the International Federation of Surveyors, FIG (President 2007-2010). He is Professor Emeritus of Land Management at Aalborg University, Denmark. He is now working as an international consultant in land administration and capacity development. Robin McLaren is director of the independent consulting company Know Edge Ltd, UK. He has supported many national governments in formulating land reform programmes and National Spatial Data Infrastructure (NSDI) strategies.